26. Count for the Birds as the Great Backyard Bird Count Begins! 35. Can circular thinking set us free from the 'recycling religion'? (Friday, February 12-Saturday, February 27, 2016) The Sustainability Solutions Festival convenes the planet’s top sustainability events and organizations to discover and explore how we can individually and collectively reimagine our lives and our planet. The Festival’s many forums and events include: Conferences, Community gatherings, and Film screenings. For more information. School of Sustainability: Show the Garden Some Love! (Saturday, February 13, 2016) Let’s show the garden some love this Valentine’s Day (and Arizona’s birthday)! Bring your family, friends, or significant other on over to the Escalante Community Garden for a beautiful morning of gardening maintenance and harvesting. From 9:00-11:00 a.m. at Escalante Community Garden, 2150 E Orange St, Tempe. More information and RSVP. (Wednesday, February 17, 2016) Walter Jetz, Yale Program in Spatial Biodiversity Science and Conservation will present Map of Life – Advancing and Using Global Species Distribution Information for Research and Conservation from 1:00-2:00 p.m. in E244, Life Sciences Center, Arizona State University at the Tempe campus. This is also a School of Life Sciences Hugh Hansen Seminar. More information and RSVP. 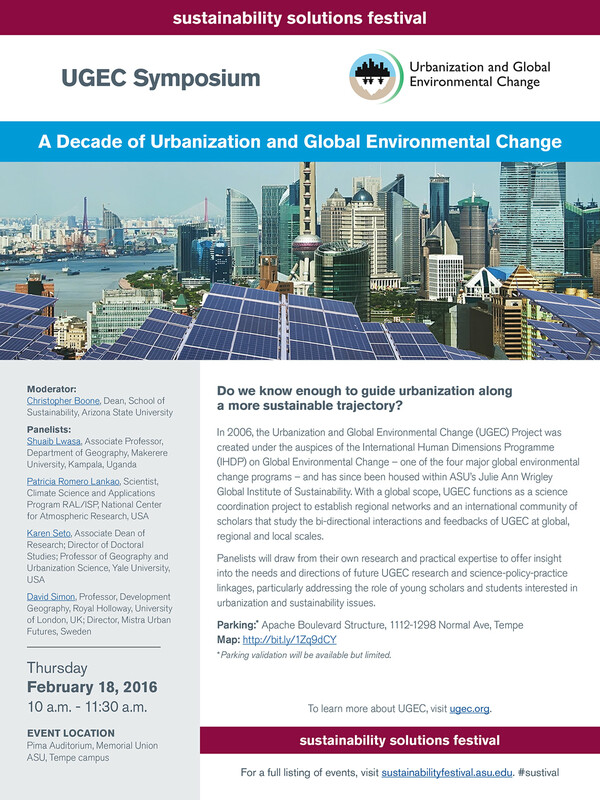 (Thursday, February 18, 2016) Shuaib Lwasa, Makerere University; Patricia Romero Lankao, National Center for atmospheric Research; Karen Seto, Yale University; and David Simon, University of London, with moderator Christopher Boone, Arizona State University will draw from their own research and practical expertise to offer insight into the needs and directions of future UGEC research and science-policy-practice linkages, particularly addressing the role of young scholars and students interested in urbanization and sustainability issues. From 10:00-11:30 a.m. in Pima Auditorium, Memorial Union, Arizona State University at the Tempe campus. More information. A Sustainability Solutions Festival event. (Thursday, February 18, 2016) Mary Evelyn Tucker, Yale University will present World Religions Respond to the Environmental Crisis in the Alumni Lounge, Memorial Union, Arizona State University at the Tempe campus. Doors open 4:00 p.m.; lecture at 4:30 p.m. More information and RSVP. A Sustainability Solutions Festival event. (Tuesday, February 23, 2016) The Farmers Market @ASU Tempe features seasonal produce, specialty food items produced in Arizona, and ready-to-eat food and beverages. From 9:00 a.m.-2:00 p.m. on the Student Services Lawn. For more information. Wrigley Lecture Series: Climate Change and Energy: How Can Justice be Achieved for Young People and Nature? (Thursday, February 25, 2016) James Hansen, former Director, NASA Goddard Institute for Space Studies and Adjunct Professor, Columbia University's Earth Institute will present Climate Change and Energy: How Can Justice be Achieved for Young People and Nature? From 5:00-6:15 p.m. (doors open at 4:30 p.m.) In the Turquoise Room (220), Memorial Union, Arizona State University at the Tempe campus. More information and RSVP. (Thursday, March 24, 2016) Wayne Pacelle, President and CEO, Humane Society of the US will present The Humane Economy from 6:15-7:00 p.m. (5:30-6:00 p.m. reception) at the Tempe Center for the Arts, 700 W Rio Salado Parkway, Tempe. More information and RSVP. (Thursday, April 14, 2016) Michael Pollen, Author and Sustainable Food Advocate, will present Your Next Meal: Where Nature and Culture Intersect. Doors open at 9:30 a.m.; lecture at 10:00 at the Evelyn Wood Music Theater, Arizona State University at the Tempe campus. More information and RSVP. (Friday, February 12, 2016) Laura Hosman, California Polytechnic State University will present Appropriate Technologies and Experiential Learning: Possibilities, Pitfalls, & Pivots from 12:30-2:00 p.m. in room 129, Payne Hall, Arizona State University at the Tempe campus. Sponsored by the School for the Future of Innovation in Society and The Polytechnic School of the Ira A. Fulton School of Engineering. More information. (Friday, February 12, 2016) Jack McNamara, The Ohio State University will present Treatment of Multi-physics in Hypersonic Flows at 1:30 p.m. in room 228, Schwada Classroom Office Building, Arizona State University at the Tempe campus. More information from Durella.ODonnell@asu.edu. (Friday, February 12, 2016) Gabriela Weaver, University of Massachusetts-Amherst will present CURES: Course-Based Undergraduate Research Experiences from 2:35-4:35 p.m. in room E106, Life Sciences Center, Arizona State University at the Tempe campus. More information. (Friday, February 12, 2016) ASU Night of the Open Door @ Downtown Phoenix offers interactive activities, tours and a behind the scenes look into what powers a world class university. Tour the Cronkite School’s state-of-the-art media complex, check out the nutrition kitchen, investigate cadavers, create your own kid-friendly comic strip and get a glimpse of the new Arizona Center for Law and Society. Whether your dream is to work in health, record your news reports or be a future public service leader – ASU Night of the Open Door @ Downtown Phoenix is pure family fun. From 4:00-8:00 p.m. on the Downtown Phoenix campus. More information. A Sustainability Solutions Festival event. (Friday, February 12, 2016) Lee Dugatkin, University of Louisville will present The Evolution of Goodness, Justice and Empathy at 5:30 p.m. in the auditorium (B105), Biodesign Institute, Arizona State University at the Tempe campus. More information and RSVP. (Friday, February 12, 2016) The 2016 Sustainability Solutions Festival has partnered with Project Humanities and School of Earth and Space Exploration to present the entire Qatsi Trilogy. This is a one of a kind exploration, through imagery and music, of the human condition on Earth in the age of accelerating resource exploitation and evolving technology. This first of three films, Koyaanisqatsi: Life Out of Balance, will be shown from 6:30-9:00 p.m. in the Marston Exploration Theater, ISTB4, Arizona State University at the Tempe campus. More information and RSVP. (Monday, February 15, 2016) JoAnne Lightly, CBET Division, National Science Foundation will present an Overview of Research Opportunities at NSF and in the Chemical, Bioengineering, Environmental and Transportation Systems Division at 10:30 a.m. in room 105 (auditorium), Biodesign Institute, Arizona State University at the Tempe campus. More information from Durella.ODonnell@asu.edu. (Monday, February 15, 2016) Joellen L. Russell, University of Arizona will present The Southern Ocean Carbon and Climate Observations and Modeling Project (SOCCOM) from 12:00-1:00 p.m. in E244, Life Sciences Center, Arizona State University at the Tempe campus. More information. (Monday, February 15, 2016) In Soo Ko, Pohang University of Science and Technology will present Current Status of the Pohang X-ray Free Electron Laser Project from 4:30-5:00 p.m. in the auditorium (B105), Biodesign Institute, Arizona State University at the Tempe campus. More information. (Monday, February 15, 2016) Gregg Pascal Zachary, School of Future Innovations in Society and Gaymon Bennett, Religion, Science and Technology will discuss The Future of Consciousness from 7:00-9:00 p.m. in the Barrett Theater, Vista Del Sol Community Center, Arizona State University at the Tempe campus. More information and RSVP. (Tuesday, February 16, 2016) Tony Hu, Houston Methodist Research Institute will present Written in Blood: Nanopore-enabled Peptimodic Analysis and its Application in Disease Detection at 1:30 p.m. in the auditorium (B105), Biodesign Institute, Arizona State University at the Tempe campus. More information. (Wednesday, February 17, 2016) Edwin Kite, University of Chicago will present Powering Cryo-Volcanoes on Icy Moons at 3:30 p.m. in the Marston Exploration Theater, ISTB4, Arizona State University at the Tempe campus. More information. (Thursday, February 18, 2016) Steven Austad, University of Alabama-Birmingham will present A New Interpretation of the Life-Extending Dietary Restriction Effect from 12:00-1:00 p.m. in the auditorium (B105), Biodesign Institute, Arizona State University at the Tempe campus. More information and RSVP. (Thursday, February 18, 2016) Weaving modern science with enduring wisdom from the world's cultures, Journey of the Universe explores cosmic and Earth evolution as a profound process of creativity, connection, and interdependence, and offers an opportunity to respond to ecological and social challenges of our times. We invite you to have lunch and discuss this Emmy award-winning film with co-author and environmental humanities scholar Mary Evelyn Tucker. The discussion is at 12:00 p.m. in room 109, Social Sciences Building, Arizona State University at the Tempe campus. Please [RSVP] as we will be providing lunch. Once you RSVP, you will be given the password to view the film [here]. (Friday, February 19, 2016) In the US alone, 40 percent of our food is wasted. To address this issue, the Zero Food Waste Forum welcomes participants to collaborate and learn from expert advocates. All stakeholders are welcome: growers, grocers, restaurateurs, distributors, food banks, disposal companies and members of the public. From 9:00 a.m.-5:00 p.m. in the Valley Youth Theatre, Arizona State University at the Downtown Phoenix campus. More information and registration. A Sustainability Solutions Festival event. (Friday, February 19, 2015) Elvin Delgado, Institute for Integrated Energy Studies and Central Washington University will present Fracking Vaca Muerta: Economic Implications of Shale Gas Extraction in Northern Patagonia from 12:00-1:00 p.m. in room L1-10, Coor Hall, Arizona State University at the Tempe campus. More information. (Friday, February 19, 2016) ASU Night of the Open Door @ Polytechnic offers a behind the scenes look into ASU’s state-of-the-art labs and learning environments. Come experience flight simulators, air traffic control simulators, the wonders of algae, new-age cars, play classic video games, and enjoy dance and theater performances. From 5:00-9:00 p.m. on the Polytechnic campus. More information. (Friday, February 19, 2016) The 2016 Sustainability Solutions Festival has partnered with Project Humanities and School of Earth and Space Exploration to present the entire Qatsi Trilogy. This is a one of a kind exploration, through imagery and music, of the human condition on Earth in the age of accelerating resource exploitation and evolving technology. This second of three films, Pawaqqatsi: Life in Transition, will be shown from 6:30-9:00 p.m. in the Marston Exploration Theater, ISTB4, Arizona State University at the Tempe campus. More information and RSVP. (Monday, February 22, 2016) Jaan Tallinn, founding engineering of Skype and Kazaa will present Toy Models of Superintelligence Control Problem at 4:00 p.m. in the Marston Exploration Theater, ISTB4, Arizona State University at the Tempe campus. More information. (Tuesday, February 23, 2016) Rene Billups Baker, daughter of Charles Billups, tell the story of her courageous father for the first time outside of Birmingham. At 4:30 p.m. in room 174, Coor Hall, Arizona State University at the Tempe campus. More information. (Wednesday, February 24, 2016) M. Sajayan will present this special event from 9:30-11:30 a.m. in the Lyceum Theater, Arizona State University at the Tempe campus. More information and RSVP. A Sustainability Solutions Festival event. (Thursday, February 25, 2016) GreenBiz University is an extension of the GreenBiz 16 conference, held at ASU’s Tempe campus. Through the Sustainability Solutions Festival’s partnership with GreenBiz, we are able to recruit top-notch speakers in sustainability to engage with the ASU community. From 12:00-5:00 p.m. in the Alumni Lounge, Memorial Union, Arizona State University at the Tempe campus. More information and RSVP. A Sustainability Solutions Festival event. (Thursday, February 25, 2016) Roberto Gaxiola, School of Life Sciences, Arizona State University will present Proton Pyrophosphatases: From Salt Tolerance to Sucrose Transport at 4:00 p.m. in room 105 (auditorium), Biodesign Institute, Arizona State University at the Tempe campus. More information. (Thursday, February 25, 2016) Michael Ignatieff, Harvard University will present What Citizens Owe Strangers: Human Rights, Migrants and Refugees from 7:00-8:30 p.m. in room 241B (Ventana Ballroom), Memorial Union, Arizona State University at the Tempe campus. This event is free and open to the public, but RSVPs ARE REQUIRED. More information and RSVP. (Friday, February 26, 2016) The 2016 Sustainability Solutions Festival has partnered with Project Humanities and School of Earth and Space Exploration to present the entire Qatsi Trilogy. This is a one of a kind exploration, through imagery and music, of the human condition on Earth in the age of accelerating resource exploitation and evolving technology. This third of three films, Naqoyqatsi: Life as War, will be shown from 6:30-9:00 p.m. in the Marston Exploration Theater, ISTB4, Arizona State University at the Tempe campus. More information and RSVP. (Friday-Sunday, February 26-28, 2016) The state of racial justice in the US has erupted in recent years. Stemming from acts of violence and brutality, the discourse around race is shifting into the public sphere. To facilitate these kinds of conversations, Local to Global Justice has selected “Racial Justice” as our theme for the 15th annual Forum and Festival. Conversations and contestations over racial justice have fueled nation-wide debates over police brutality, housing quality and gentrification, poverty, economic and educational, disparity, access to food, transportation and health care. To be held at Farmer Education, Payne Education, and Coor Hall buildings on the Arizona State University, Tempe campus. For more information. A Sustainability Solutions Festival event. (Saturday, February 27, 2016) Arizona State University Night of the Open Door @ Tempe is a rare opportunity to get a behind the scenes look into the spaces that house our most innovative projects. ASU Night of the Open Door offers you the opportunity to hear firsthand from ASU students and faculty about rare poisonous insects, space exploration, volcanoes, drones and robots, medical breakthroughs and Mayan discoveries. Interactive hands-on activities offer a wide spectrum of sciences, engineering, humanities and the arts. From 4:00-9:00 p.m. on the Tempe campus. More information. A Sustainability Solutions Festival event. (Wednesday, March 2, 2016) Julie Sze, University of California-Davis will present Climate Justice in an Age of Ecological Insecurity from 3:30-5:00 p.m. in room 135, West Hall, Arizona State University at the Tempe campus. More information. (Friday, March 4, 2016) Arizona State University is currently number one in applications to Teach For America and they have one final deadline for seniors to apply. Click here and listen to President Obama describe how Teach For America is making an impact. More information. Count for the Birds as the Great Backyard Bird Count Begins! (Friday-Monday, February 12-15, 2016) Put your birds on the map and help create the most comprehensive snapshot ever of the world's birds during this year's Great Backyard Bird Count, February 12-15, 2016. Count birds for at least 15 minutes at any location, then enter your checklist at birdcount.org or use the eBird app on an iOS or Android device. (Saturday, February 13, 2016) Citizens' Climate Lobby is a national organization dedicated to the implementation of a carbon fee and dividend plan as a market-based way of putting a price on carbon emissions. The Phoenix-area CCL group meets at 10:00 am on the second Saturday of each month to plan its efforts. The location is as follows: Escalante Multi-Generational Center, 2150 E. Orange St. in Tempe. Please join us. For more information, visit http://citizensclimatelobby.org or e-mail pe4rcaz@gmail.com. (Monday, February 15, 2016) Along with Arizona Science Center’s engaging exhibits, ASU and its community partners host special interactive, hands-on activities for families. Join us at the Arizona Science Center to learn more about sustainability and how you can become agents of change. More information. A Sustainability Solutions Festival event. (Saturday, February 20, 2016) The Sustival Day of Service connects volunteers to projects that help make more resilient, vibrant and sustainable communities across the Valley of the Sun. From 8:00 a.m.-12:00 p.m. More information. A Sustainability Solutions Festival event. (Monday, February 22, 2016) AZ Thrives is a business conference for Arizona’s minority and small business leaders that is focused on the concept of the circular economy. The event aims to not only educate Arizona business leaders on sustainability in business, but also to create change agents through meaningful connections within the community. From 9:00 a.m.-5:00 p.m. at Phoenix Convention Center, North Building, 100 N. 3rd St, Phoenix. More information and registration. A Sustainability Solutions Festival event. (Tuesday-Thursday, May 24-26, 2016) The conference will consist of plenary and session presentations with discussions on regulatory, governance, legal, policy, social and ethical aspects of emerging technologies, including (but not limited to) nanotechnology, synthetic biology, biotechnology, genomics, personalized medicine, stem cell and regenerative medicine, human enhancement technologies, telecommunications, information technologies, surveillance technologies, geoengineering, neuroscience and robotics. The conference is premised on the belief that there is much to be learned and shared from and across the governance experience and proposals for these various emerging technologies. To be held at the Tempe Mission Palms Hotel and Conference Center, Tempe. Call for abstracts due January 31, 2016. More information. Too much George Patton and not enough Steve Jobs. Lack of innovation, rigid inflexibility instead of creative adaptivity and stubborn adherence to using past solutions for future problems are leaving the United States with a vulnerable military, said Thomas Ricks, a Pulitzer Prize-winning journalist who recently spoke at Arizona State University. Read more. Arizona State University and two other major research institutions today formally launched the PLuS Alliance, a new tri-continental partnership to help find research-led solutions to global challenges and expand access to world-class learning. Read more. Some of our most vital biological functions rely on the body’s natural ability to gather up specific types of molecules, and then move and distribute them to organs and other internal locations where they’re needed. Basic cell growth, muscle movement and many metabolic functions are among the fundamental processes driven by this capture-transport-release mechanism. Read more. In the 100th-anniversary year of Einstein’s theory of relativity, scientists announced they have proved it. Using a stunning display of technological prowess, a group of physicists measured gravitational waves, a ripple in the fabric of space caused by the collision of two immense objects far out in the universe. Read more. Kevin Langergraber has been studying chimpanzees in the wild for 15 years. Before he became a professor and had to teach eight months out of the year, he’d spend six months to a year at a time in the field, 12 hours a day, seven days a week. Read more. Recycling waste is more trouble than it’s worth, according to John Tierney, author and New York Times science writer, in his widely read and contested Op-Ed, "The Reign of Recycling." Read more. When helmets clacked together during Super Bowl 50, the echoes might have been heard differently than in years past. Call it the concussion awareness effect. In the 12 months since the last Super Bowl, the ongoing debate about football and brain injuries has only increased, with the conversation reaching different audiences thanks to the film “Concussion,” starring Will Smith as the doctor who discovered chronic traumatic encephalopathy (CTE) — which is believed to be caused by repeated head trauma — and how it was prominent among retired football players. Read more. The Environmental Research and Education Foundation (EREF) is one of the largest sources of solid waste research funding in the U.S., allocating approximately $1 million annually in research grants and graduate level scholarships. Thus far, over 50 students have been EREF scholars, many of whom are now in key academic and professional positions across the U.S. The application for the 2016-2017 academic year will be online in February 2016. The application deadline is May 4, 2016 at 5:00 pm (eastern). Click here to view a list of information/materials required for the application. Pacific Biodiversity Institute is offering a 4-week Conservation Science and Leadership Course, May 23 through June 19, 2016. The course will be held in the spectacular North Cascades Mountains and students will gain a diverse and holistic view of ongoing conservation and management issues prevalent throughout the Pacific Northwest. Application deadline is March 5, 2016. More information. January 2016 drought summary is online. The November 2015 Southwest Climate Outlook is online. More details on how to review the fellowships and apply. Application deadline February 16, 2016. More information. Application deadline February 19, 2016. More information. Agricultural Resources Advisor, Foreign Agricultural Service, Washington, D.C. Application deadline February 25, 2016. More information. Application deadline February 26, 2016. More information. Application deadline February 29, 2016. More information. Application deadline March 1, 2016. More information. Application review begins March 2, 2016. More information. Full consideration date March 15, 2016; closes April 1, 2016. More information. Application deadline March 15, 2016. More information. Application deadline March 25, 2016. More information. Application deadline March 31, 2016. More information. Go to ASU Student Jobs and search for job requisition ID 20299BR. Research Analyst, Industrial Economics, Inc.
Requisition number 400355. More information.